Some of these restored antique tractors are scheduled to be at Inman Farm Heritage Days this weekend. Photo/Submitted. Inman Farm Heritage Days, an annual September celebration of a mostly bygone Fayette County and rural Georgia lifestyle, will return this weekend for the 22nd year. Above, some of these restored antique tractors are scheduled to be at Inman Farm Heritage Days this weekend. Photo/Submitted. The three-day festival, which kicks off Friday, Sept. 21 and continues through Sunday, Sept. 23, will take place on Minter’s Farm, approximately five miles south of Fayetteville on Hills Bridge Road just off Ga. Highway 92 South. Admission is free, although visitors are encouraged to purchase souvenir programs, which are sold for $3 with the proceeds used to support the show. The organizers are able to present the show with no admission fee thanks to the ongoing efforts of dozens of volunteers, donations from individuals and organizations that support Inman Farm Heritage Days, and by sales of souvenir T-shirts, hats and programs. Adamek said the community-wide effort to host Inman Farm Heritage Days reminds her of the barn-raisings of days gone by. “What we see here each September is a sign that the old-time practice of neighbors working alongside neighbors for a common cause is not only alive and well but being passed on to my generation as well as to those younger than me,” she said. On the cover of this year’s souvenir program is Inman native Charles Harp, who has spent nearly his entire life farming, even as he’s operated several highly successful businesses. 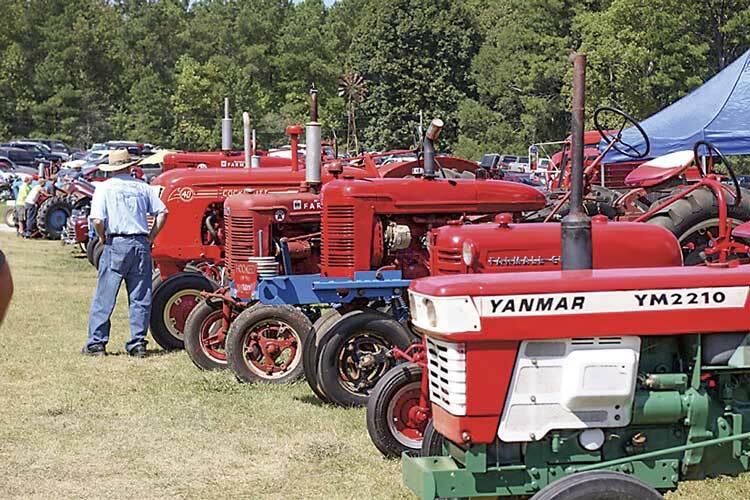 Besides the antique tractors, engines, cars and trucks that have become a large part of Inman Farm Heritage Days, there will be working exhibits including a broom shop, printing press, sawmill, planer, syrup-making, a cider press, pea threshing, weaving, grist milling, moonshining and more. The show also features a number of food vendors, crafts and activities for children. Alcoholic beverages are not permitted. Handicap parking is available as well as wagon shuttles from parking lots. Parking is free. Another highlight of the weekend is the worship service at 9 a.m. on Sunday morning. The Inman United Methodist Church holds the service in a wooded area on the site where brush arbor services were held nearly 200 years ago, and the public is invited. For more information, visit Inman Farm Heritage Days on Facebook, check mintersfarm.com or call 770-461-2840. Next articleReady for some good news?